Pressure grouting is an essential construction procedure that is practiced by contractors and engineers around the world. Used since the 19th century, grouting reduces the amount of leakage through rock for dam foundations and underground works. It also strengthens soils to provide a stable foundation to support the weight of surface structures, such as buildings, bridges, and storage tanks. In addition, it is frequently used to repair deteriorated concrete and to produce concrete underwater. Grouting Equipment Manual: Selection,Operation, Maintenance, and Repair introduces various types of equipment employed in pressure grouting applications performed in geotechnical works and examines the operating principles and maintenance issues relative to each equipment type. The term pressure grouting encompasses a wide variety of applications and operations, including dam foundation grouting, soil stabilization and permeation, consolidation and compaction grouting (except low-mobility), water cutoff and structural stabilization in rock tunnels, deep foundations via drilled piers, underwater concrete, structural concrete repairs, raising of settled slabs and structures, rock and soil anchors, and machine foundations and bases. The applications for pressure grouting operations are almost limitless, as the equipment can be employed anywhere fluid grout can be used. 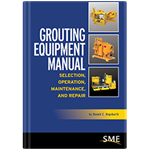 Primarily intended for machine operators and maintenance mechanics, this manual will also prove useful to specification writers, engineers, contractors, purchasing managers, and others who have a responsibility to specify, acquire, operate, or maintain pressure grouting equipment. Topics covered include mixers, agitators, pumps, delivery systems and accessories, but not electronic monitoring and other ancillary equipment. 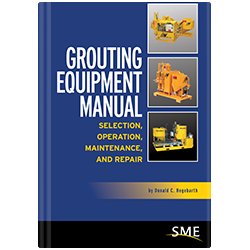 This manual will help grouting machine operators perform their work without unnecessary stoppages from equipment failures, so a main focus is maintenance and repair of the various components common to most grouting equipment. Generic examples are used and are not intended to be specific to any particular machine.